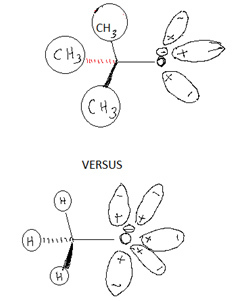 The figure shows a comparison of the effect of solvation on the “stericaly hindered”, t-butoxide anion and the methoxide anion. Solvent molecules easily approach the negatively charged oxygen atom in the smaller methoxide anion. If alkyl substituents, replaces hydrogen, the acidity of dissolved alcohols decreases. Solvation and intermolecular association are important contributing factors. The steric effect is reversed in the gaseous phase, where effects are observed in “isolated molecules”.